The Payment Card Industry Data Security Standard (PCI DSS) provides data protection requirements for organizations that process card payments. These requirements have even been adopted as law by some US states (e.g., Minnesota, Nevada, Washington). 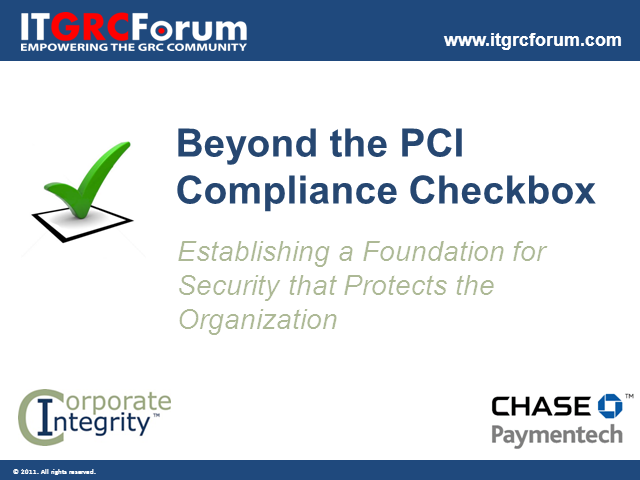 While organizations that fully comply with PCI DSS are considered compliant credit-card processors, compliance and security are not one in the same. An organization can be breached without cardholder data being compromised, but there are other valuable items in the companies possession â customer PII, strategic information, patents and innovations, as well as reputation and trust â that can be equally or more costly to lose. 1. How the threat landscape is indeed dynamic, but the effective system exploits remain the same as in the late 90s. 2. Why the COMPLIANCE environment hasn't changed much â the same threats are still valid, and the same vulnerabilities are still being exploited.